Trust Felling, the trailer experts. No matter what you are hauling, from lawn mowers to skid steers, to backhoes, to pavers, Felling has the trailer and the features to make your journey from the worksite to the highway a smooth one. Offering more construction trailer models for more markets than any other manufacturer. Lano Equipment is proud to partner with Felling Trailers, whose diverse Construction Trailer product line is the answer for contractors all over the midwest. With trailers ranging from 3,000 lb. Light Utility Trailers to larger 120,000 lb. Heavy Haul Application Trailers, Felling is the key solution for your hauling needs. 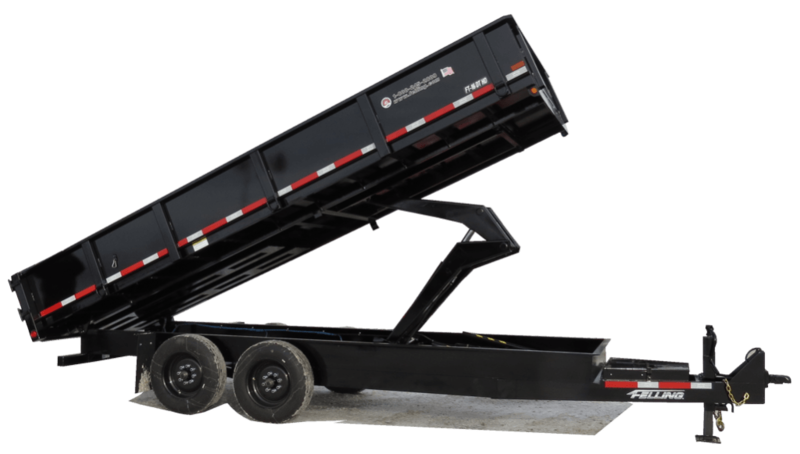 Lano Equipment can help you select the best dump trailers, drop deck trailers, deck over tag trailers, and more. Exacting standards, attention to every detail, that’s Felling. Serving the Commercial Transport Trailer Industry for over 30 years, Felling’s ability to design trailers to user’s specification has made them the leader in filling the void for many commercial fleets. From various deck lengths to multiple options. Felling — The Trailer Experts. Felling trailers available in these models and many more. Capacities range from 7,000 to 21,000 lbs. 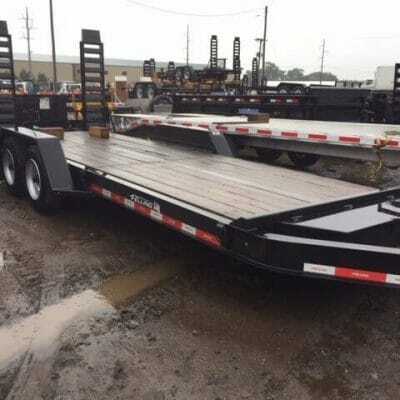 Drop Deck Trailers – Also known as a “Deck Between the Wheels” or a “Skid Loader Trailer” is a smaller capacity trailer designed to carry smaller compact equipment like a scissor lift or skid loader. 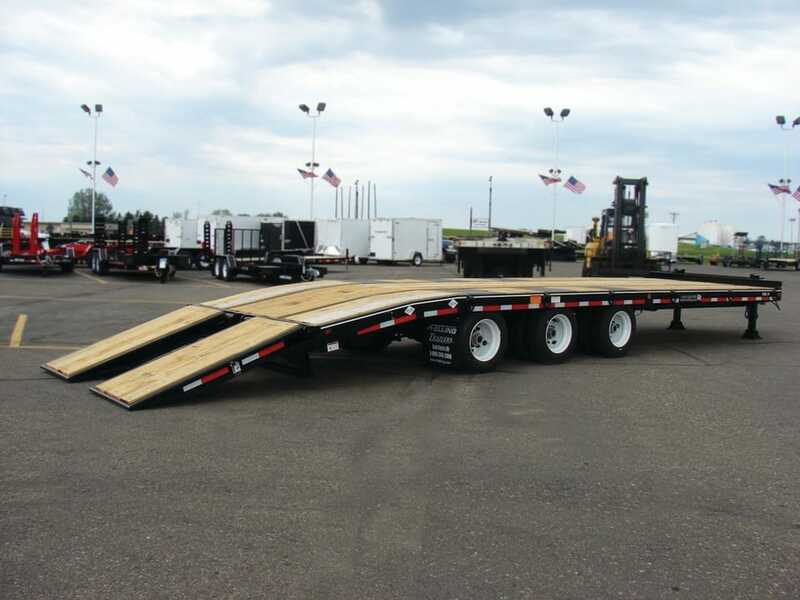 Drop Deck Trailers can be equipped with various ramp options or with a deck tilt feature. Felling Trailers offers 4 main model lines of drop-deck trailers (deck between the wheels, low deck, ramp trailer.) Which trailer model line is right for your application will depend on the equipment you are transporting. Capacities range from 4,500 to 16,000 lbs. Felling offers an expansive model line of hydraulic dump trailers. No matter the application, Felling offers the right dump trailer to get the work done. Felling Dump trailers are utilized in a variety of industries from landscaping, rental yards, constructions sites big and small. Talk to your Lano Salesperson today to get a Felling Dump trailer fitted to your needs. From small to big jobs, Felling’s DT & DT HD “heavy duty” hydraulic dump trailers are built rugged to handle everything you can dish out and be ready for more. 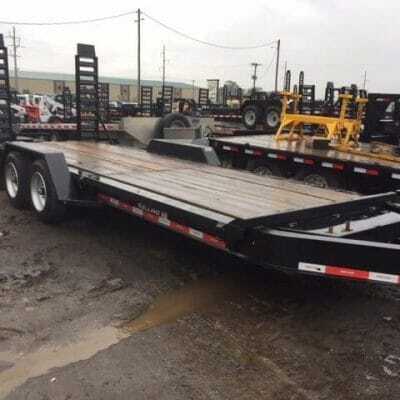 Felling deck over tag trailers are perfect for hauling pallets and medium weight equipment. Each trailer is constructed with an engineered, cambered, fabricated main frame beam. The web and flange of each beam are laser cut, in-house, then fused together producing a clean, consistent quality weld and proper camber of each beam. The main frame beams are pierced precisely for the I-Beam crossmembers to be inserted through the main beams, thus producing the lower deck height. Capacities range from 25 to 60 tons. Felling has been manufacturing construction semi-trailers for over 25 years. Through that time we have designed and engineered a diverse model line offering that caters to the needs of equipment haulers. These lines are an ideal fit for transporting construction, agricultural, and industrial machinery. Available in the MX Series, Narrow Neck, Rigid Gooseneck Tilt, Hydraulic Detach, and moany other configurations.